Over 2,000 people are killed by arms … every day! Excessive military expenditure, unregulated arms trade, and the possession of nuclear weapons by eight of the world’s most powerful states are – without doubt – some of the primary impediments to security. We work on disarmament issues to create a robust framework for addressing the challenges of security, including a critique of militarism, over-armament, and the use or threat of use of force. We believe that disarmament and arms control must always be approached through the lens of international humanitarian law and as an imperative for human rights and human security. The debate must begin to shift away from weapons as tools for “state security” and instead focus on the necessity of human beings to be protected against the impacts of such weapons. Our international disarmament work is coordinated through our very well-known Reaching Critical Will (RCW) programme. Reaching Critical Will monitors multilateral disarmament processes and facilitates civil society participation in meetings and conferences. They also produces research studies and reports on key disarmament issues, contributing critical analysis and advocacy for disarmament, reduction of military spending and demilitarisation in order to achieve human security and justice. 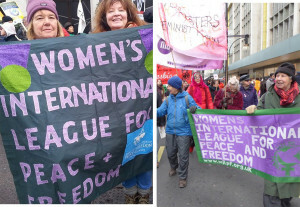 WILPF is a steering committee member of the Stop Killer Robots coalition and a member of ICAN UK. Many of our members also support Campaign Against Arms Trade (CAAT) in their own capacity, with some attending the CAAT demonstration at the Arms Fair last September. Follow updates on The Nuclear Ban Treaty. Participation in the ICAN Nukes of Hazard campaign that monitors the movement of nuclear convoys throughout the UK. Ongoing.